The country’s biggest celebration of dub, reggae and soundsystem culture returns to Edinburgh for its fifth iteration. From modest roots as a one-night one-venue event in 2011, the Wee Dub programme has expanded to span 3 days in March across 7 central Old Town venues. Tickets are available for either the whole weekend at £37 including the booking fee (over-18’s only), or for individual sessions; see the festival programme for prices. They can be purchased online or at one of several venues in Edinburgh and Glasgow; for details, click here. MCN celebrates its 60th anniversary with Scotland’s biggest motorcycle show, to be staged at Edinburgh’s Royal Highland Centre over a weekend in March. In addition to sporting the latest models from household names, for which MCN are able to procure exclusive offers, there will be live action stunt showpieces, and a raft of goods available in the Bike Jumble sale and Retail Village. The show will also host the country’s most comprehensive range of classic motorcycles, spanning over 8 decades, in its dedicated Classics Pavilion. Children between the ages of 5 and 11 will be able to partake in a supervised bike ride along a purpose-built street scene courtesy of Honda. Advance tickets are available until 9pm on Friday 6th March and cost £12 per day for adults and £10 for seniors (over-65’s), while children (under-15’s) are admitted for free. Tickets will also be available on the day at a cost of £16 for adults and £14 for seniors. Additional parking charges of £6 per car apply (there is no charge for motorcycles) – see the FAQ. This celebration of Edinburgh’s fashion scene encapsulates shows and catwalks, shopping evenings, styling sessions, and offers and giveaways. Reserved seating for the runway shows held in the fashion hub on The Mound over the opening weekend has been completely booked out, but unreserved seats in the back rows will be available each day. G&V Hotel will provide samples of their afternoon tea selection to attendees, and a range of beverages, including the Italian imports of Prosecco and Menabrea, and the locally-brewed Pickering’s Pea-cocktails and Gin and Tonic, is to be served as refreshments between perusing the pop-up shops. The itinerary for the opening weekend can be viewed here; see also the events and offers held over the week. This student-organized charity fundraiser comprises a 5k Fun Run, 10k Run, Half Marathon and Full Marathon, with entry costing £15, £22.50, £27.50 and £40 respectively, and open to ages 11+ (with an adult companion, either spectator or runner), 16+, 17+, and 18+ respectively. 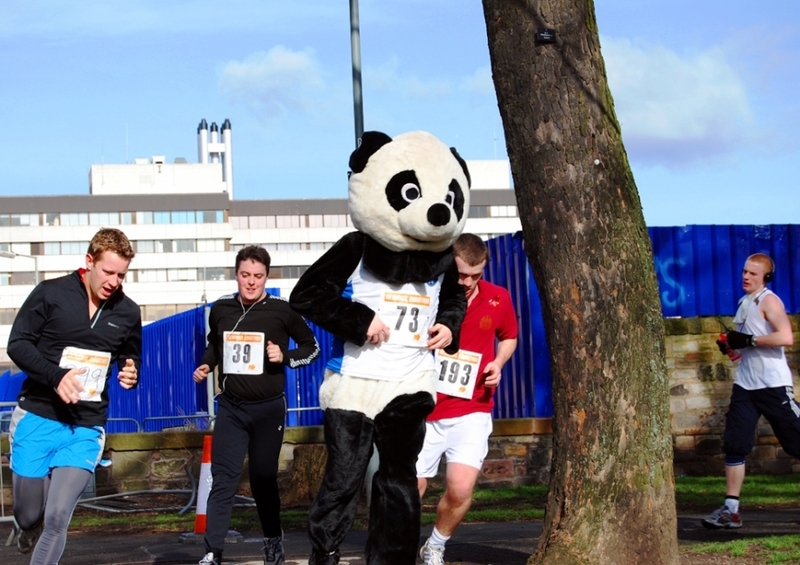 A range of offers, discounts, and promotions are detailed here, with qualification criteria including the number registering to run, the amount raised, and the best team and individual costumes. You will be able to register on the day, but the prices of all runs except the Full Marathon will increase. All proceeds from the event go to charity, and if you are fundraising you can choose the beneficiary. All runs consist of differing numbers of laps of the Meadows; the only requirement beyond age is that entrants be confident of their ability to complete their chosen course. Race time restrictions, which are 6 hours for the Full Marathon and 3 hours for the Half Marathon, will be in effect; runners can continue after this but roads will reopen and the organizers’ auspices will be withdrawn. The course route (subject to minor alterations) can be found here. Encompassing yarn, knitting, crochet, spinning, weaving, and felting, this event will unite teachers, designers, and over 100 vendors at Edinburgh’s Corn Exchange. Visitors of all capabilities are welcome, and catering will be available in the festival’s yarn café. This year’s programme will also see the advent of a podcast lounge set, where visitors can meet podcasters from the knitting industry. Advance booking of tickets will confer access to a fast-track queue on the day, but tickets will also be available to purchase at the event. They can be purchased via this page at a cost of £8 for entry each day and £12 for the weekend. Classes must be booked separately at £47 each, and include admission on their respective day (or £53 for a class and admission on both days). The one exception is the Quotidian Colourwork class, which comes to £54 and £60 respectively, because of the volume of yarn used. There is disabled access to all 3 venues, and children aren’t admitted to any classes. There is also an evening party, ‘Ca-BAA-ret’, from 7pm until 11pm on the Saturday, including a talk on the publishing of the KNITSONIC Stranded Colourwork Sourcebook, and a knitting-themed quiz with prizes. Party tickets cost £17 and include a drink of your choice; visitors on the Saturday will be able to stay in the yarn café after the closure of the marketplace for the hour until the doors to the party open at 6.30pm. Edinburgh’s Irish community will be celebrated on and around St Patrick’s Day (Tuesday 17th March). The lineup for this year includes a series of talks on various Irish topics at Word Power Books, a free traditional concert held in Princes Street Gardens, a performance from an acclaimed Irish dance troupe at The Jam House, a community pageant with pipe and jazz bands along Portobello Promenade, and an exhibition in Central Library (details still to be confirmed). Another festival which originated in Edinburgh in 2011, like Wee Dub, the Scottish Tattoo Convention has returned each year since, and is now the most anticipated event of its kind in the country. It is to be held in Edinburgh Corn Exchange, and will draw from an international pool of tattooing talent. A predominantly adult-themed programme of entertainment, from professional wrestling to burlesque, has been lined up for the event, in keeping with the age 18 restriction for tattoos in Scotland, although children under 16 can be admitted to the convention if they are accompanied by a paying adult. Tickets cost £23 per day, including the processing fee and collection either in-store or at the event, and £24.60 if you opt for them to be posted out to you (recorded delivery). A weekend ticket costs £34 to collect and £35.60 to be posted. Yet a third festival in this month’s roundup with its inception in Edinburgh, having celebrated its 30th anniversary last year, Puppet Animation has expanded countrywide to become the UK’s largest performing arts event for children. The programme encompasses family-friendly performances, workshops, and films, and incorporates over 150 events for 2015. Listings can be found here; there appears to be a problem with the advanced search so at present visitors have to navigate through the pages and manually find those that meet their preferred criteria. As usual, we’ll provide reminders and ongoing coverage of several of these events on our Facebook and Twitter channels, so follow our accounts to stay up to date. Finally, let us know what you’re planning to do in Edinburgh this March using the comments function, and stay tuned to this blog for future entries in the series and more besides.